Earn the record for most games watched in style with glasses featuring baseball's "unbreakable" stats. Earn the record for most ballgames watched in style with our set of tumblers, which feature some of the baseball's "unbreakable" stats. From the lowest ERA (Dutch Leonard) to the longest hitting streak (Joe DiMaggio), these career and season stats were achieved under unusual circumstances or by extraordinary players, thus making them—you got it —impossible to break. The records are printed within simple illustrations in classic colors (and also listed on the opposite side), making drink mixups as unlikely as breaking Ted Williams' on-base percentage. The finishing touch is an imprint of a baseball—complete with stitching—in each sham. Glassware made in the USA, decorated in Las Vegas, Nevada. Click to view the stats. Learn more about the inspiration that led our Product Development team to step up to the plate and create these Record-Breaking Baseball Glasses on our blog. My husband loved these glasses. These glasses are very unique. My husband was so pleased with them. He really likes the style and the historical baseball stats. Anyone who loves baseball would be very happy with them . This was a perfect gift for a client who is a big baseball fan! Product was as described. Well made, great idea. Would have been 5 stars except for the following comment. Item was described as top shelf dishwasher safe. It was not. Decal flipped over on one or two of the glasses. Super cool gift for baseball fanatic! The glasses are definitely NOT top rack dishwasher safe. After 2 washes, the emblems are peeling off. I hope my family member will use it every time there is a game or for a party. 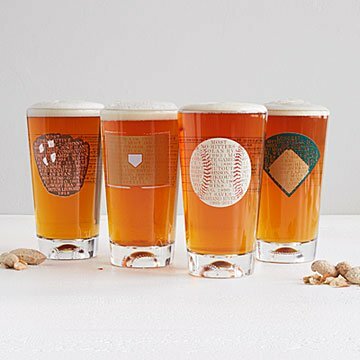 Very solid glasses, good conversation pieces for baseball fans. Fun to read all the interesting facts/stats while drinking your favorite beverage. Great conversation piece.